As the title of this entry might suggest the latin culture is very prevalent in San Antonio, and is just one of the many features that makes me glad I chose to study at UIWRSO. Upperclassmen will tend to say, “Second year is so hard!”, but now that I have completed my “segundo año ” I can confirm that it is not THAT hard. It just takes dedication, time management, and focus. We all know that being in graduate school, especially a health professional program, is NOT supposed to be a cake walk. The fall and spring semesters of second year include lectures and labs specifically designed to prepare you for the final lab proficiency. This lab proficiency is typically held at the end of April, and is a time where students are evaluated on all clinical skills required to conduct a comprehensive eye exam. Upon passing the final lab proficiency and second year courses, you will be awarded your white coat. The white coat symbolizes the beginning of patient care and your commitment to The Optometric Oath. This ceremony is such an exciting time for family and friends to come and celebrate the past 2 years of hard work and commitment. 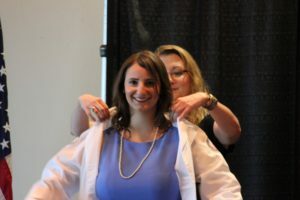 Receiving your white coat is not nearly as exciting as your actual first day of clinic. Nerves are obviously heightened during the first clinic day but your preceptors do a fantastic job of helping ease the anxiety. Clinic is conducted in groups of 4 interns and the first half of summer semester you are paired with a classmate to conduct each exam. As the summer semester continues, you will begin to see patients by yourself and speed up your exam time. My main piece of advice about your “segundo año” is to go in with confidence, don’t treat it any different than your first year. Be confident in your knowledge and skillset. Make sure to stay ahead in your studies and don’t get caught up in the day to day worries. Think of the big picture and the final outcome: starting clinic!